​The Orbee-Tuff® Raspberry is the smallest member of the best-selling Orbee-Tuff® Produce Line. This juicy little morsel is perfect for the smallest dogs. The Treat-Spot is perfect for stuffing with Planet Dog Eats, offering small dogs bushels of fun! ​The Orbee-Tuff® Strawberry is a delicious part of the best-selling Orbee-Tuff® Produce Line. 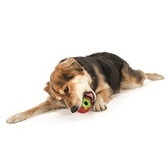 This juicy morsel is perfect for small and medium sized dogs. The Treat-Spot is perfect for stuffing with Planet Dog Eats, offering dogs bushels of fun! ​The Orbee-Tuff® Artichoke is a delicious part of the best-selling Orbee-Tuff® Produce Line. This nutritious morsel is perfect for medium sized dogs and offers a unique texture for added fun. The Treat-Spot makes it perfect for stuffing with Planet Dog Eats, offering dogs bushels of fun! 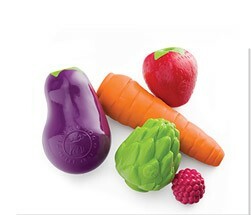 ​The Orbee-Tuff® Eggplant is a delicious part of the best-selling Orbee-Tuff® Produce Line. This nutritious morsel is perfect for medium and large dogs. The extra large Treat-Spot makes it perfect for stuffing with Planet Dog Eats, offering dogs bushels of fun! ​The Orbee-Tuff® Carrot is the latest addition to the best-selling Orbee-Tuff® Produce Line. 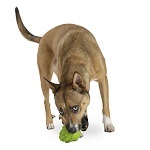 This nutritious morsel is perfect for most sized dogs because of its tapered shape. The extra large Treat-Spot makes it perfect for stuffing with Planet Dog Eats, offering dogs bushels of fun!